 Everybody's looking for Felix (the Cat) Guerrero. Since the accidental death of his daughter and the subsequent suicide of his wife, Martha, Martha's father, well-heeled investor Edwin Talmage, has had Felix in his sights. And now that the Cat has taken up with Elizabeth Anglin, her husband Trini, crown prince of Denver's leading crime family, would like to have a word with him too. 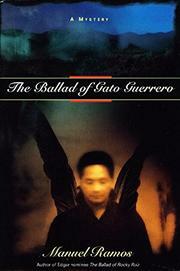 When Felix brings Elizabeth out to visit his friend Luis Montez, the Denver lawyer (The Ballad of Rocky Ruiz, 1993), Anglin sends one Joey Cuginello after the lovers to ventilate Luis's house. And Luis can't even take the time off to sweep up the spent shells; he's got his hands full with Victor Rodriguez, hell-raising son of a client who's been beaten up by the law--who've responded by remanding Victor to Luis's personal custody for one long month. No wonder every other chapter of this lively, disjointed tale ends with a free-for-all that breaks up somebody else's furniture. The evil and retribution are distributed with a hand so generous it smacks of second-novel blues, though Ramos miraculously ties up more loose ends than you'd ever have imagined.